Get Customized Europe Email List, European Mailing List, and European Telemarketing list to reach your targeted Companies and decision makers in Germany, Italy, France, United Kingdom, Switzerland and other European countries. If you wish to strengthen your market base in Europe, Blue Mail Media’s Europe Business Executives List can help you connect with key decision makers, business executives and professionals across France, Italy, Switzerland or any other country. 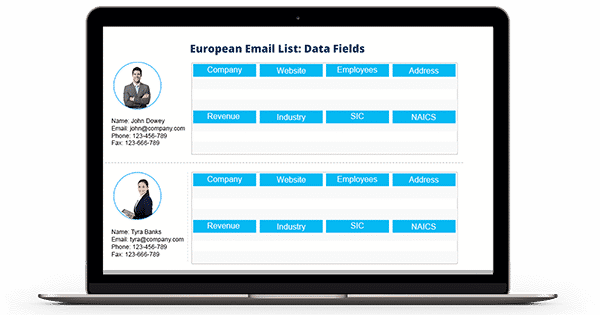 Our Europe Business Executives Database provides you the most qualitative, authentic and reliable data to flawlessly execute your marketing campaigns. Whether you wish to reach your target market via telephone, email or mail, our list provides you the access to all the needed information to do so. Our European Business executive’s database has over 18 Million contacts from all verticals and all departments. Blue Mail Media houses a proficient team of data scientists, data experts, researchers and analysts who go an extra mile to ensure your data needs are met in a timely manner and you achieve greater success in your marketing campaigns. Blue Mail Media does not use the ‘One Size Fits All Approach” as it believes that each business has a unique set of needs and objectives. Thus, we allow our clients to avail our pre-packaged European Business Email List or they can opt for a customized list based on specific selects relevant to their businesses. You can be assured of the authenticity of our data as we follow stringent data collection policies and invest significant energy and time in verifying data through emails and phone calls. Our List of European Companies Database can help you eliminate the need to pass through multiple communication gateways and significantly boost up your marketing drive. Eventually, this would have a positive effect on your campaign response rate, conversion rate, as well as Return on Investment.